MacDonald Dettwiler and Associates (MDA) appears to be on a roll, not to mention an order backlog of around $3 billion, about $1 billion more than a year ago. MDA is the operator and worldwide commercial data distributor for the RADARSAT-1 and RADARSAT-2 satellites. Based in Richmond, B.C., MDA is active in two principal markets. The largest is its communications division which provides space-based solutions for cost-effective global delivery of direct-to-home television, satellite radio, broadcast internet and mobile communications. Its surveillance and intelligence division is a supplier of space-based and airborne surveillance solutions, satellite ground stations, and geospatial information services. With more than 4,800 employees operating at 11 locations in the United States, Canada and internationally, MDA truly is a global aerospace leader and technological influencer. In Canada, it has some 1,700 employees, with 700 based in Richmond, 600 in Montreal (Satellite Subsystems) and 300 in Brampton (Robotics and Automation). Its surveillance and intelligence division is based in Richmond and has offices in Dartmouth, N.S. and Ottawa. It includes end-to-end space missions, robotics and automation, airborne surveillance solutions, ground-based systems and geospatial services. MDA provides geospatial information and monitoring services derived from radar imagery and other sources to customers in defence, weather, transportation, energy and mining, and more. The company’s end-to-end space missions provide operational surveillance and monitoring solutions for civil, defence and commercial applications, while its robotics and automation unit provides the robotics for the International Space Station, including the Canadarm and Dextre. Dextre is an extension of the Canadarm2. The dexterous dual-armed solution will be able to touch, sense, and respond much like a human. It is used for many of the servicing and assembly tasks performed by astronauts on space walks. MDA’s geospatial services are one of the largest satellite radar data providers in the world and the operator and worldwide commercial data distributor for the RADARSAT-1 and RADARSAT-2 satellites. MDA is also developing next-gen space automation capabilities for planetary exploration and on-orbit satellite servicing and repair. As part of its airborne surveillance solutions, the company provides unmanned aerial vehicle (UAV) surveillance that supports a wide-range of defence and commercial applications and aviation solutions to improve the safety and productivity for civil and defence air operators, among other applications. MDA offers turnkey UAV services, airborne radars, and related systems that turn data from surveillance sensors into meaningful insights for its customers, including system design and development through logistics support, training, maintenance and other operational services. Its airborne radar solutions provide high resolution imaging, advanced moving target identification and other advanced detection and identification modes. UAVs have a ceiling of 20,000 feet and a flying time of 24 hours, and because they’re a real airplane, they must be flown like one from the ground. And they shouldn’t be referred to as drones, which have a connotation of not being smart or not being able to think, according to MDA, whereas highly trained pilots operate UAVs or intelligence officers that can make decisions on how to fly the aircraft. MDA’s airborne radar solutions provide high resolution imaging, advanced moving target identification, and other advanced detection and identification modes. In October alone, MDA signed a $40-million contract amendment to provide UAV surveillance for the Royal Australian Air Force through to December 2017 with options for up to an additional three years. MDA’s service supports the RAAF plans to further develop Australia’s unmanned surveillance and reconnaissance capabilities. It signed another contract valued at US$6.4 million under its Indefinite Delivery/Indefinite Quantity (IDIQ) agreement with the U.S. Air Force to further enhance the flight path safety system that aids the design of airport approach and departure flight paths. The value of contracts awarded to date under the IDIQ agreement total approximately US$20.2 million. The U.S. Air Force uses an MDA-developed ground-based flight path design system, which supports the design of aircraft flight paths between the airport terminal area and en route phases of flight. MDA is extending this system, incorporating the Federal Aviation Administration terminal instrument procedures’ rules associated with satellite based navigation. MDA was also awarded a contract worth $10 million to provide multiple communication subsystems to Airbus Defence and Space. Not bad for a month’s work, which only includes aerospace related agreements. Other contracts were signed with undisclosed values. In addition to signing these deals, MDA completed the acquisition of Advanced Systems from General Dynamics, which specializes in the development and application of radar and other information sensors for the U.S. government with annual sales of about US$40 million. The deal is also expected to boost MDA’s ability to pursue other opportunities in the U.S. market. After visiting MDA management in November following the release of its third quarter results, National Bank financial analyst Kris Thompson was told the company is taking “aggressive steps” to improve the efficiency of Space Systems/Loral (SSL), two years after it was acquired by MDA for $875 million. SSL, with $1.1 billion in revenues in 2011, is a leading provider of geostationary commercial satellites, with experience building and integrating some of the world’s most powerful and complex satellites and spacecraft systems. The company has a long history of delivering satellites and spacecraft systems for commercial and government customers around the world and currently has more geostationary commercial capacity on orbit than any other manufacturer. In September, MDA was selected by the U.S. Air Force Space and Missile Systems Center to work with U.S. government agencies to host government payloads on commercial satellites. With a value up to $494.5 million, the Hosted Payload Solutions contracts pre-qualify SSL to bid on opportunities for hosted payloads, which can help the U.S. government get a variety of missions to orbit by integrating them with commercial satellites. The hosted payload concept speeds access to space and reduces space segment cost for both government and commercial missions. MDA also plans to shift the surveillance and intelligence business towards more services, with more focus on intelligence within the government (versus lower-margin civilian applications) and pursue commercial opportunities. At the end of October, an undisclosed customer selected MDA for its eighth satellite award in 2014. 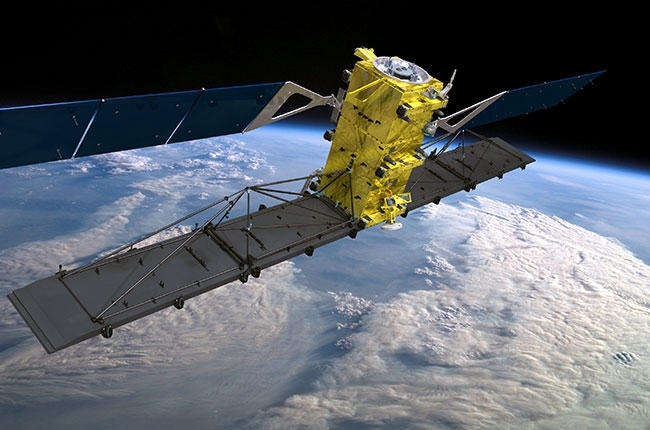 “We estimate that MDA is winning 30 per cent of commercial satellite contracts for the year. SSL’s active satellite builds this year are the highest in the company’s history,” said Thompson. Flow its third quarter results, MDA report sales of $507 million ($463.2 million a year ago), of which $373 million came from the communications side of the business, up 11 per cent from a year earlier and $134 million from surveillance and intelligence, a six per cent hike from the year earlier period. For the first nine months, revenue increased to $1.55 billion from $1.34 billion. For the year, Thompson estimates total revenue will be $2.069 billion, versus $1.818 in 2013 and will reach $2.227 billion in 2015. Communications will account for 72 per cent of the total and surveillance and intelligence will make up 28 per cent. In fiscal 2012, communications accounted for 44 per cent of MDA’s revenue, then shot up to 73 per cent in 2013, while surveillance and intelligence declined to 27 per cent from 56 per cent. That’s because in 2012, communications revenues only included SSL’s results for two months as the acquisition was only completed in November 2012. In 2013, it included 12 months of SSL revenues. In terms of geographical revenue, Canada represented 33 per cent of the total in 2011, but dropped to 13 per cent in 2013. During the same period, Europe also declined from 31 per cent to 14 per cent, but Australia went from eight per cent to 18 per cent. Asia and South America have predictably increased their respective shares. This shift is again attributed to the inclusion of SSL revenues in 2013, but not in 2011. However, geographical segmentation could change “significantly” from one year to the next, so a single year does not indicate a trend, according to the company. With such diverse product offerings in its two divisions, MDA looks to be capable of growing both on the ground and in the air.